The tragedy is, as amazing as Battlefield 4 looks in this short montage, it's not really representative of the game as it exists. More than anything, watching it made me realise that it's been a while since I last played Arma 3. Even if it is a fiction, it's an incredibly well made one. The scenarios are beautifully shot and the editing keeps the action snappy and exciting. It's a reminder that amazing things can happen in a Battlefield games; just probably not in standard play on public servers. 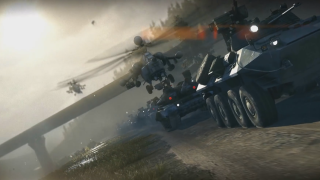 Perhaps unsurprisingly, the team that made the video previously made an equally impressive looking Arma 3 "trailer". You can see that below.